From the launch of The Great British Coin Hunt to record sales prices for Kew Gardens 50ps, 2018 has been a big year for coin collectors. But whether you’re new to collecting or a seasoned pro, it can be hard to know which coins you should look out for. Which? reveals the coins that have proved most popular in 2018, and how much they could be worth. Which rare coins have been most popular in 2018? We’ve used coin collection site Change Checker’s ‘scarcity index’ to identify the top five £2, 50p and 10p coins that have proved to be the rarest and most sought-after this year. As a general rule, if a coin is rare and has a lot of collectors wanting to buy it, people are willing to pay more for it. We explain the factors that make a coin valuable later on in the article. See the graphic below for the five most popular rare £2 coins of the year, along with the average amount they’ve recently sold for on eBay. The values shown are the mean amount of the three most recent eBay sold prices for an uncirculated coin. Currently, the four UK coins for the 2002 Commonwealth Games are the most valuable, followed by the £2 coin showing the handover of the Olympic Games from London to Rio de Janeiro. This might all change once the 2017 World War One and Jane Austen £2 coins enter circulation, as their historical importance are likely to make them highly sought-after. This graphic shows the five most popular rare 50p coins, and their recent average eBay sale price. 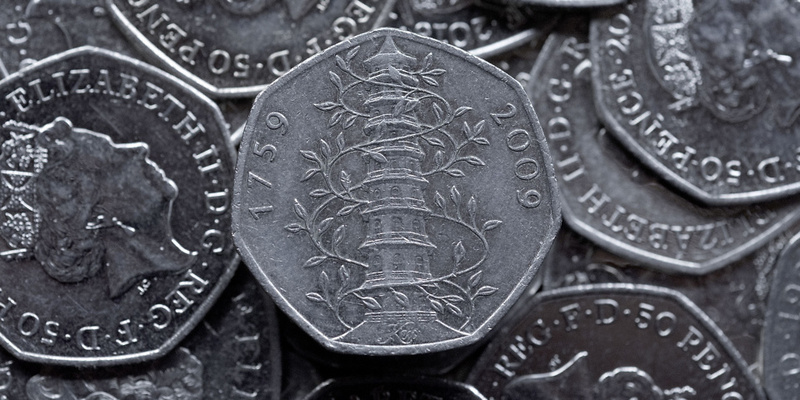 The 2009 Kew Gardens coin has been the rarest and most valuable 50p coin for some time. However, as the 2012 Olympic coins drop out of circulation by getting lost or snatched up in collections, their value may increase. The Beatrix Potter 50p collection is also popular, so those coins could also become increasingly valuable as collectors seek to complete their set. Lastly, here are the five most popular 10p coins from The Great British Coin Hunt series, which launched earlier this year, plus the amount they could be worth according to recent eBay sales. When the A-Z 10p coin collection was first introduced in March, only 2.6m coins were released into circulation – making them pretty hard to come by. However, another 2.6m coins were released in October, with the hope that more people would be encouraged to start collecting them. There are several factors that might mean a coin can be sold for more than its monetary value. The rarity of a coin depends on its mintage, meaning how many coins of that design have been released into circulation. Part of the reason the Kew Gardens 50p is so valuable is that it has the lowest mintage of any other 50p coin. Only 210,000 coins were released by the Royal Mint in 2009, meaning there’s only a very slim chance you’ll be lucky enough to find one in your change. Find out more: is this rare 50p more valuable than the Kew Gardens coin? Does it have an error? Coins found with errors tend to fetch higher prices as the error makes them much rarer than their ‘perfect’ versions. There’s an accidentally undated 20p coin design, which was released into circulation in 2008, that has proved popular with collectors. Regardless of how rare a coin is, it’s unlikely to fetch a premium if it’s so scratched up and dirty you can barely see its design. Coins that are still shiny and have been looked after tend to fetch higher prices. Is it part of a collection? People are often driven to collect all the coins that come as part of a collection. Therefore, if you happen to find one such coin – say, part of the A-Z 10p coins, or a Beatrix Potter 50p – there’s likely to be a collector out there who need it as the final piece in their set. The heightened interest makes the coin more valuable. Plus, when people collect coins, they take them out of circulation, making the remaining coins even rarer. Should I invest in rare coins? While you may have seen many news stories about certain rare coins being sold on eBay for hundreds of pounds, you should be aware this is rarely the case. The best way to see how much a coin could be worth is to look at how much identical coins have sold for on eBay – this will show how much someone might be willing to pay for it. However, keep in mind that unscrupulous sellers may seek to inflate the price by placing their own bids or creating fake listings. Always look for more than one listing to find a mean price, check how many bids an item has received and whether it was actually sold. Which? has also carried out an investigation into the dark side of the coin investment craze, finding worrying instances of firms implying possible future profits, and individuals being sold fake coins. Coin specialists (known as ‘numismatics’) tend to discourage buying rare coins as an investment, and instead enjoy coin collecting as a rewarding hobby. Rare Kew Gardens 50p sells for £400: do you have one at home?